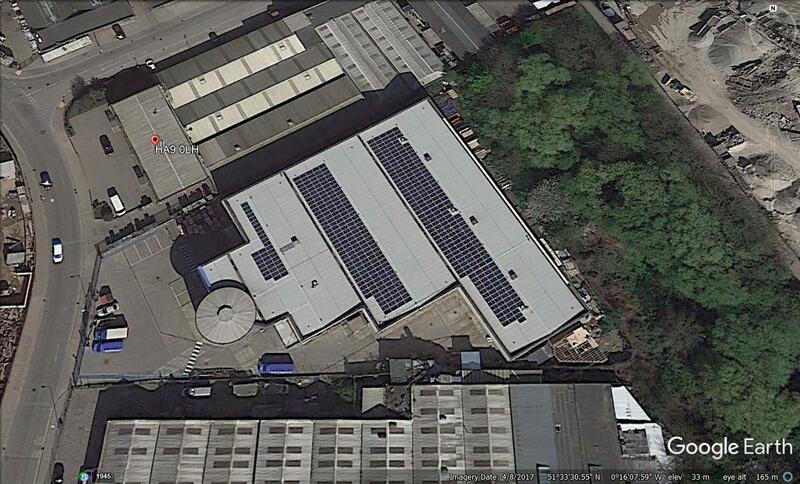 What a great aerial view of a 100kW Solar PV installation we did earlier this year down in Wembley. 452 panels were used. Look at those straight lines!! Find out how you can save money on your energy bills. 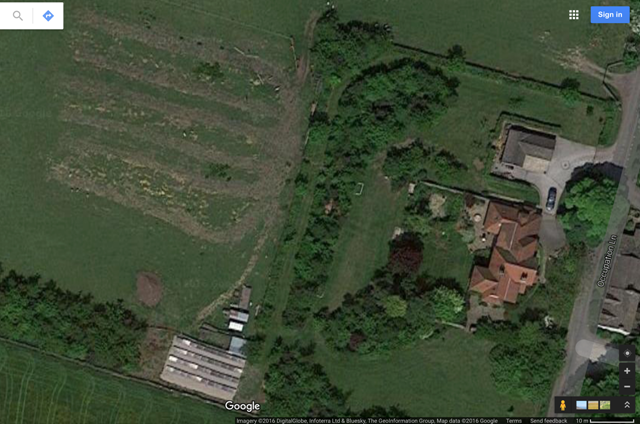 This week we are installing a 14kW air source heat pump and a 4kW solar PV system in a Victorian converted mill. Next week we are heading to Windermere to install two air source heat pumps and one solar PV system in a converted barn. We might be Yorkshire but we do travel! 87 air source heat pumps serviced and repaired last week in the Norwich and Peterborough area for a Housing Association. 3 frozen old ladies now very happy! 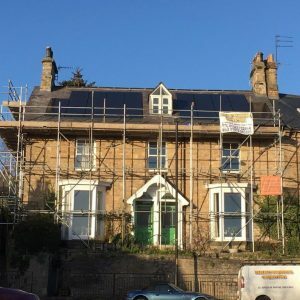 Great Google view of this install in Leeds – you can see the 6 slinky trenches for the Kensa heat pump and the 10kW solar array all making the Old Rectory seen to the West very energy efficient! Another happy customer sent us an email this week with figures showing the heating costs slashed and solar output bang on target. It is also exactly a year since we installed the meters for the solar power, heat pump and solar Iboost. 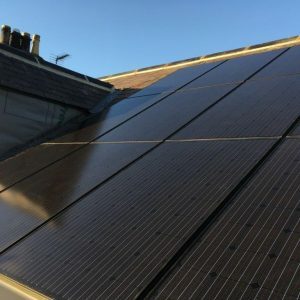 First and foremost, we have been absolutely delighted with the system which matches the quality of the installation which was second to none. The constant heat is brilliant and fears of installing in an old house were unfounded. Of course, given the size of the installation, there were a few teething problems, but most importantly your speed of sorting these out was brilliant. Thank you for your help. Everything seems to work well. Even the chimney balloons that I attached an elastic cord to, to capture in case they went up the chimney again! The most surprising bonus was the solar iBoost that has used over 2000 kWh of free solar power. Interestingly, during the winter, we need to run the hot water heating for longer to substitute for the solar iBoost. The thermostat in the house is set on 19.5 degrees day and night 24/7 except when on holiday when it is dropped down. My mother is very jealous but enjoys looking after the kids at our house! This week we installed a fantastic Viridian in roof system in Richmond. 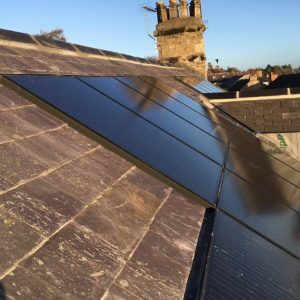 7kW looks great on this slate roof. This week we received an email from a very happy customer showing how much he is now saving since he swapped his gas boiler to an air source heat pump. Next week we will be installing an 8.5kW air source heat pump and underfloor heating at an exciting and innovative new build on a steep bank to the river at Boston Spa. This week we are installing a complete new heating system for a rebuild in Appleton Wiske consisting of a 14kW air source heat pump and underfloor heating. Also we are installing an 11kW solar PV system to drive it all. The heating system has mostly been paid for by £12,000 from the Renewable Heat Incentive!